When I first became a vegetarian in 2013 I thought my sandwich life would consist of egg salad, peanut butter and jelly, and grilled cheese sandwiches. Quite honestly, even when I did still eat meat, my sandwich choices weren’t very creative. One thing that being a vegetarian has taught me is how to be more creative with my food choices. After all, having to piece together sides at a steakhouse to create a meal forces one to think outside of the box! We’re including some links to recipes below to help spark some ideas, but remember that the best sandwiches are always the ones that suit your specific taste, so don’t be afraid to tweak and refine! The right (or wrong) bread can seriously make (or break) your sandwich. Like many people, when we were growing up we relied on plain old generic off-the-shelf white bread. Today, however, many grocery stores have their own bakeries that offer a wide variety of scratch-made whole grain breads. While not all breads are conducive to sandwich making, try experimenting with a few you’ve never tried before. You may find a new favorite! Also, whoever defined “sandwich” as this-or-that between two pieces of sliced bread was sorely lacking in the creativity department! Get creative with pita, naan, an English muffin, or a bagel (especially toasted!). Or come up with something else completely new! Check out this article from the Happy Herbivore for more vegan bread options. Whether you are vegetarian or vegan, your choices of sandwich spreads are certainly not limited. Lacto-ovo vegetarians who eat dairy and eggs can use standard mayonnaise, but there are also some non-dairy/egg mayos available these days. Just Mayo brand is one of our favorites. The state of your veggies really really REALLY matters! Wilted veggies can take a sandwich from hero to zero, so be sure to use only the best! This is especially true if you’re making a veggie sandwich without faux meats or cheeses. If a raw veggie sandwich sounds too boring, try grilling them or sauteing in red wine for powerful flavor. How about this amazing recipe for a grilled veggie panini? This looks so good! Don’t Forget About Veggie Burgers and Other Faux Meats! A meatless sandwich doesn’t necessarily mean veggies only. There are some delicious faux meats on the market, and more options are popping up all the time. Yes, many are processed and therefore not the healthiest choice, but if you’re craving a burger why not try a meat substitute to satisfy that craving? You can also grill a portobello mushroom and top with caramelized onions for a delicious meatless burger, or heat vegan meatballs in pasta sauce for a classic meatball sub. Tofu can also be used as a sandwich filling. Just remember that tofu is flavorless on its own, so you’ll need to marinate it before baking or pan-frying. The good thing is that marinade possibilities are endless, so you really can create a truly unique sandwich. Check out Peta’s “12 Vegan Meat Brands That are Changing Everything!” for more on faux meats. For healthier, less-processed options, try making your own bean burgers, falafel or vegan tuna salad made from hummus. Jackfruit and portobello mushrooms also do a remarkable job of subbing in for meats especially sloppy joes or BBQ. Since most vegetarians still eat dairy and eggs, there’s no need to substitute the cheese unless you are trying to reduce your consumption of dairy. If that’s the case (or if you are vegan), there are some great vegan cheese options to explore. Much like faux meats, vegan cheese has come a long way in just a few short years. Demand for vegan cheese is on the rise and doesn’t show any indication of slowing down, particularly as more companies compete for market share. Spreadable vegan cream cheeses such as those from Kite Hill, or thinly sliced Chao vegan cheese from Field Roast can make wonderful additions to your sandwich. Check out Cooking Light’s article We Tried 19 Vegan Cheeses—Here Are the Ones Worth Buying for some vegan cheeses worth trying. Try thinking outside of the “salt and pepper” box and consider some other spices you can add to give your sandwich a flavor blast. Roasted garlic, lemon juice, red pepper, curry, herbs de provence, and smoked paprika can really pep up an otherwise plain sandwich. Don’t be afraid to experiment! For more on spices that work particularly well in vegetarian dishes, check out The Vegetarian Flavor Bible: The Essential Guide to Culinary Creativity with Vegetables, Fruits, Grains, Legumes, Nuts, Seeds, and More, Based on the Wisdom of Leading American Chefs by by Karen Page. As you can see, the possibilities for an amazing sandwich are endless! We hope this article has inspired you to experiment with some creative sandwich options. 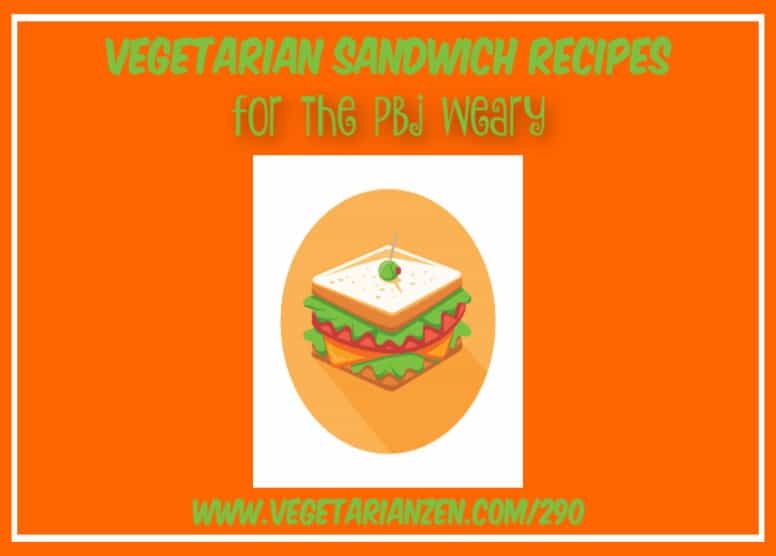 Listen to Larissa and I talk about vegetarian sandwich recipes in episode 290 of the podcast. Tell us what your all-time favorite sandwich is in the comments section! Question: What is your favorite vegetarian (or vegan) sandwich? Previous Post: « VZ 289: 7 Blackstrap Molasses Benefits and Some Recipes!